How does a children see the world? To decide if an architecture is successful or not, sometimes it's good to experience it from the point of view of the ones who will inhabit it. This is the question that Federico Landi and Valentina Cafarotti have asked themselves, when challenged to produce a video of the building by CLAB Architettura, the architectural studio who designed it in Salionze, a small town in the Verona county. As a result of this reflection, they chose to film the space through the eyes of the children, lowering the usual point of view of the camera to their height. With this trick, in the video - which is the first ever produced by the FlagLab - we can experience how this space works: we can enjoy the colourful walls and the playground with all the toys, and see the teachers escorting the kids to have lunch, and in the classrooms. Showing the space both empty and full of life, we are given the opportunity to explore how such places live every day. The soundtrack, which is original and created for the video, gives rhythm to the narration and makes it playful, as this space should be, proving how videos can help illustrating building, putting architecture in motion. 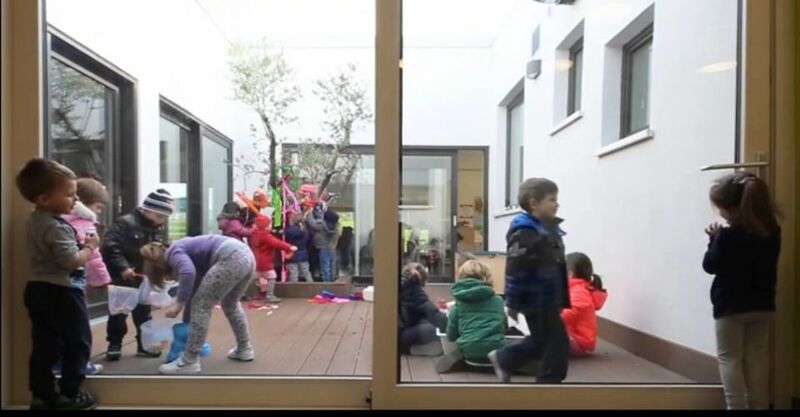 If the furniture, the rooms, the outside area were conceived to create a place where children could move, play and discover the world safely, FlagLab's video gives us a glimpse of what their world looks like.